Analysts predict gold mining stocks will recover in the future. 2. How do I Make Money in Penny Gold Stocks? Gold stocks are one way investors can take advantage of future increases in gold prices. Buying the physical metal may be a popular way to store wealth, but this strategy does not generate income. You have to sell the gold to realize any profit. You can, however, create steady streams of income by investing in gold stocks that pay dividends. Gold Resource Corporation, ticket symbol GORO, pays a $0.72 dividend, which translates into a generous 4.80 percent yield. Gold Resources has a 57 percent dividend payout ratio, which means the company pays out 57 percent of its net income in the form of dividends. Despite falling gold prices, the company reported third quarter revenue -- ending Sept. 29, 2012 -- of $6.872 million as opposed to second quarter revenue -- ending June 29, 2012 -- of $4.125 million. The company has a market capitalization of $790.18 million and has active mines in Mexico. 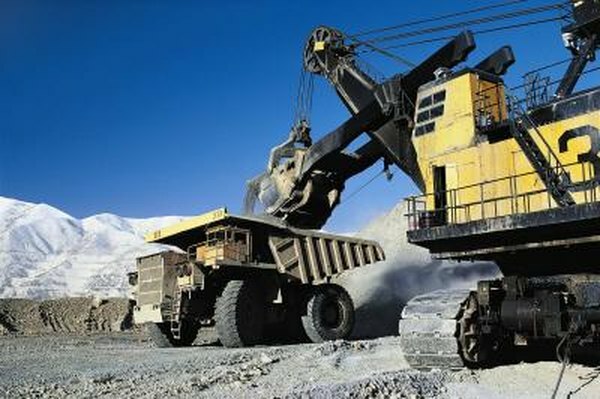 Barrick Gold Corporation, ticket symbol ABX, pays a $0.80 dividend and has a 2.40 percent dividend yield. Barrick Gold has a 21 percent payout ratio. The company posted third quarter revenue of $618 million compared to second quarter revenue of $750 million. The largest gold mining company in the world, Barrick Gold has a market cap of $34.26 billion and has mining operations in North and South America, Africa and the Australia Pacific region. Goldcorp Inc., ticket symbol GG, pays a dividend of $0.54 and has a dividend yield of 1.50 percent. Goldcorp has a dividend payout ratio of 29 percent. Net income for the quarter ending Sept. 30, 2012, was reported as $498 million as opposed to net income of $268 million for the quarter ending June 30, 2012. Goldcorp has a market cap of $29.22 billion, with mining operations in Canada, the United States, Mexico, Guatemala and Argentina. Newmont Mining Corp., ticker symbol NEM, has a dividend yield of 3.10 percent and pays a dividend of $1.40. Newmont Mining has a dividend payout ratio of 37 percent. The company saw a dramatic rise in third quarter net income of $367 million compared to second quarter revenue of $279 million. The company has a market cap of $22.62 billion and has active mines in the United States, Mexico, Ghana, Peru, Indonesia, New Zealand and Australia. What Causes the Price of Gold Stocks to Fluctuate? Are There Any Mutual Funds That Hold Gold Bullion?